We had an email from Nylablue's mum Sherri-Ellen today saying that they are taking a break from Blogging as Nylablue is having a rough time with another flare up from her bowl disease and that her mum is taking time out to nurse her girl,plus Sherri-Ellen is not to well either and is trying to control her Fibro Flare up too.And wanted to let everyone know about their absence. So we are asking you all too rev up the Power of Paw for our dear friends to help them through this rough time. On another Note we wanted to thank Ku from Haiku by Ku for passing on to us the opposite attracts award to us,we already had been given this one but we really wanted to show our thanks to our new pal. 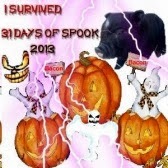 and Our friend Bacon at piglove has just completed 31 days of Spook and has given all his friends this award for surviving his 31 days of Spook,and we are looking forward to is again next year! Tomorrow is Blog 4 Peace day so don't forget to put you Peace globes up! And Guy Fawkes night is comming up on the 5th November Please keep your pets safe inside including Bunnies as they can die of fright from the noise of the fire works going off and check your bonfires for Hedgehogs before lighting them up as they like to nest in piles of wood. We send healing vibes and POTP to Nylablue. Yikes the booms booms started yesterday. I will be behind the sofa for some time this week. Have a serene Sunday. Good morning Cap'n oh Cap'n and his first mate! Bless little Nylablue and her mummy - a break would be a good thing for them to recuperate, and I LOVE THE NAME BACON! I must go visit this piggy! 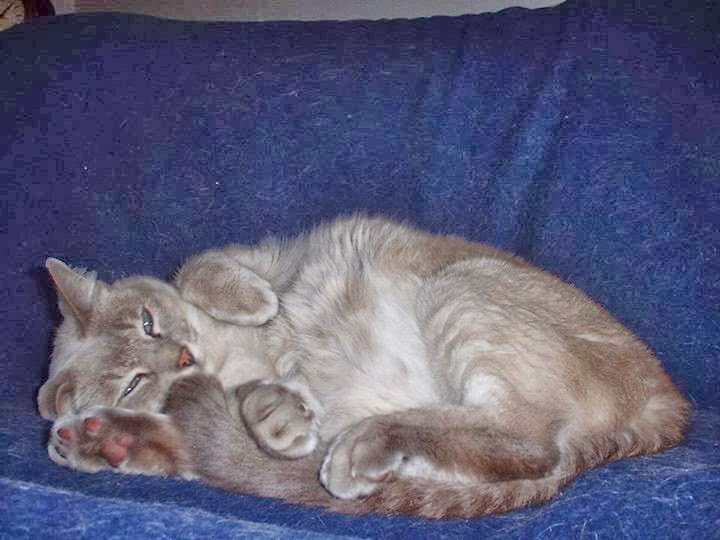 We are sure purring and praying for dear Nylablue. Hi Speedy and Mum, hope you two are having a nice Sunday. I didn't know about Guy Fawkes. I hope all the animals are safe. Sorry to hear about Nylablue. Speedy, I'm so sad that Nylablue and Sherri-Ellen aren't well. I will send a lot of healing power to Canada and both are in my thoughts. Thanks for the information and conbunnylations to your award and for being a brave bunny for 31 days of spook! I'm gonna be sendin' lots and lots and LOTS of purrs for our dear friend. Lots and lots of 'em. I'm so sorry to hear that Nylablue and her human are both doing poorly right now. I'm sending lots and lots of purrs to both of them! We are purring and woofing for Nylablue and her Mom. We will say a special purrayer for them too. Thanks for letting us know, Speedy! Poor Nylablue, Sending lots of love, hugs, purs, doggy kisses and POTP, thinking of you all you're all in our thoughts and prayers. I don't know Nylablue, but I am sending lots of purrs for her and her mum. Thanks for letting us know about Nylablue, Speedy. We're purring for her. And congrats on your awards. Oh Speedy! Yous is such a great furrend! Wes is purraying hard for Nyla and her Mommy! And Look at yous go with the AWARDS! Me is totally impressed! Yous ROCKS!!! My thoughts and prayers are with them. Hope they both feel better soon. All our feets are crossed. Oh, I'm so sorry to hears about Nylablue and her Moms! I'll be sendin' them lots of healin' vibes and good thoughts!! Hi Speedy, Ku here. you're very welcome! And thanks for more sweet words for my Nylabluewoooowoooooo! Congrats on the awards Speedy! Thats too bad about Nyla-Blue I hope she gets better soon!!! !